You can import up to five images, one at a time, for wallpaper from a USB flash drive. 4. Select Clock/Wallpaper Type, then open the Wallpaper tab. The picture name is displayed on the list. 6. Select a desired picture. The preview is displayed on the left side on the screen. 7. Select Start Import to save the data. The display will return to the wallpaper list. 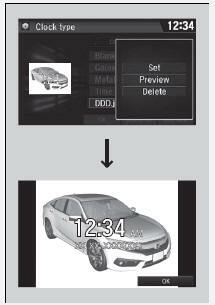 The wallpaper you set up on Clock/Wallpaper Type cannot be displayed on the driver information interface. When importing wallpaper files, the image must be in the USB flash drive’s root directory. The file name must be fewer than 64 characters. The file format of the image that can be imported is BMP (bmp) or JPEG (jpg). The individual file size limit is 5 MB. If the USB flash drive does not have any pictures, the No files detected message appears. 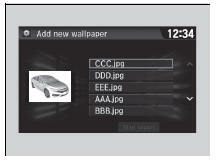 After changing the screen interface design, you can change the wallpaper by following procedure. 2. Select and hold empty space on the home screen. 4. Select Gallery, Live wallpapers, or Wallpapers. 3. Select Clock/Wallpaper Type, then open the Wallpaper tab. The screen changes to the wallpaper list. 4. Select a desired wallpaper. 4. Select a wallpaper that you want to delete. 6. Select Yes to delete completely. From the pop-up menu, select Preview to see a preview at full-size screen. To go back to the previous screen, select OK, or select . To delete all wallpapers you add, select Delete All, then Yes.